Dame Gillian Lynne 1926-2018. Once upon a time. Dame Gillian Lynne, who has died at the age of 92, quite simply changed the way we think of dance. Her husband, actor Peter Land, announced on Twitter the death of his “darling Gillie”, sharing that she was adored by many and had left “a huge legacy”. The opening of Andrew Lloyd Webber’s musical Cats, which premiered in 1981 in London, became the focal point of that legacy and the moment we were captivated by a new, frenetic and fantastical choreography. A wonderful article in The Independent about Gillie’s career. I suspect in the coming days, weeks and months there will be many. 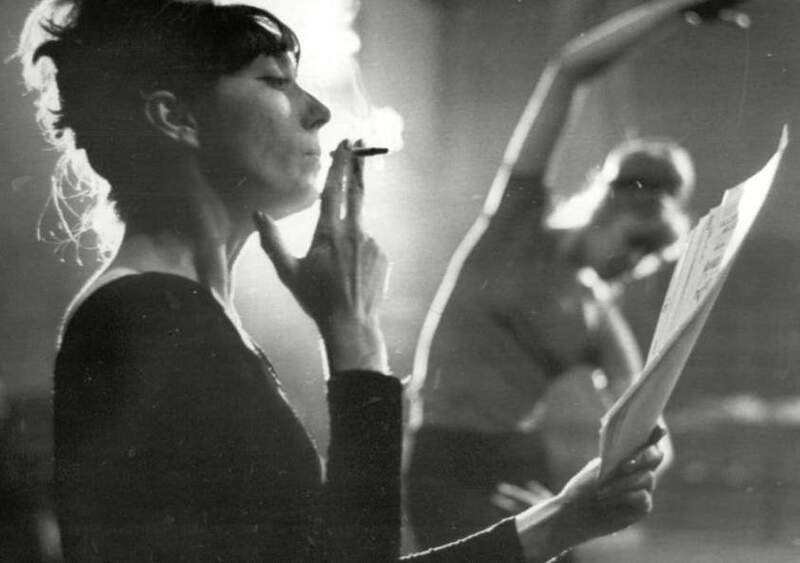 She was one of the great choreographers of our times and in no small part responsible for much of the style of the modern musical. But I want to say something about her personally. Gillie was one of Mike’s oldest friends. Also one of his first friends he introduced me to. We’d only been together for six months or so when she went to Spain to visit us – and I had the distinct impression I was being auditioned. In the nicest possible way, of course. She just wanted to make sure I was suitable. Those were dark times, those early days. To say Sotogrande was a hostile environment for a gay couple is putting it mildly. Homophobia wasn’t just acceptable, it was the norm. My confidence was faltering. I wasn’t sure I could deal with the pressure, the gratuitous aggression. And then during her visit, one evening after dinner, Gillie sat us down and told us our personalities could not have been more suited to each other – and to just shut the rubbish out of our lives. We followed her advice. As much as possible, anyway. When you live somewhere it’s almost impossible to shut it all out. Along with Mike’s mother, she was our first official endorsement. That was almost 18 years ago. A loss and a reason to celebrate (a life) all together. Sad and joyous at the same time. Your personal account of this astonishing bright flame who leaves behind a phenomenal legacy in her discipline and who will ever be remembered is touching and entrancing. Thank you for a lovely tribute to a true great. She simply sounds like a wonderful human being. I’m gonna read more on her. This post is a wonderful tribute to her and how she touched your life in such a meaningful way. You went on to prove her right. This must have brought her comfort in later years whether in Sotogrande or in France where you’ve settled now where I hope the homophobia is distinctly less. Much happiness to you both and I’m sorry for your loss. It always fascinated me how bleeding edge of the wedge Spain was in 2005 when it passed civil marriage for sexual minorities. Then the next was Spain in 2005, the same year Canada legalized it. Then 4 long years of drought until 2009 when Norway and Sweden passed it. Two years later in 2012 we add Denmark and then finally in 2013 France grants Marriage Equality along with Brazil and New Zealand. Dragged and screaming finally the US Supreme Court settles the matter and the US joined the free and equal countries in 2015. If I did my math right it looks like you and Mike were together before any country had legalized equal civil marriage. You were probably living there around 5 years before Spain granted equal rights, so yes I agree with you, those were probably not fun and games times. Legal Discrimination under the law, where your State can legally discriminate against you, promotes the culture to personally discriminate against you as well. Just know with certainty ever barrier you and Mike break down, every person who is forced by virtue of your very presence to reevaluate the assumptions they grew up with, is a barrier that a young gay person after you does not have to break. I’m so glad that the people in your lives who mattered to you were also supportive of both of you as a couple. Gillie sounds like an amazing woman, Mike and then you were so fortunate to have her in your lives. I never thought to ask, or if I did I forgot, are you and Mike married? Yes, we were together from 2001, so before the law was passed. Spain is complicated in a sort of similar way to America. There are very progressive zones (like Catalonia) and then areas where people are stuck in the mindset of Franquism (National Catholicism). Before gay marriage some regions in Spain already recognised domestic partnerships (Andalusia where we lived was one of them) – but we lived in a wealthy right wing enclave. The wealthy elite in Spain are mostly right wing, Catholics, monarchists etc. In the early days people would say things like, “I’d like to invite you to my house but for a garden party rather than a sit down dinner because I think my husband wouldn’t like a gay couple at the table…” Don’t think I let that pass without a good response 😉 – but just as what you’re saying, Mike thought we had the responsibility to participate in things (even when I didn’t want to, and I never wanted to) because it was the only way to create social change. He’d say, imagine if one of these people has a gay child, instead of just hearing the negatives they’ll see us and think it’s possible to be gay and have a have a place in the world and demand respect from these people. That being said, it was an exhausting parcours. We were invited to lunches, dinners and events in general all the time and built into that were people who invariably tried to take potshots at us. That made me more and more abrasive as the years went by, and it wasn’t good for me. It’s the smallest acts of kindness that often leave the deepest impressions. Thank you for sharing. I’m glad you are married. Probably everyone who knows you is glad you are married. I bet Gillie was glad you two guys got married, was glad that the world changed enough in your lifetimes that that was an option for you, and option that we straight people take for complete granted. Off topic, my wall painting project crashed and burned. What worked on a small square sample on the wall didn’t work at all on a huge wall. I even bought half a gallon of Floetrol which helped but just didn’t work. I could not get a consistent effect, some areas had more paint some less and it looked terrible. Finally today my husband went and bought me more base colored painted and I just painted over the area I had started. I am now doing sponge painting, it’s okay but I can’t say I am thrilled with it. Maybe when the whole huge wall is done I’ll like it more, we’ll see. Sponge painting is a hellva lot faster I will say that. Effects can be tricky. I find choosing colours incredibly difficult. The red we have in the Zuber room looks fantastic from sunset on, but during the day it’s a bit too bright. And the blue-grey in the bathroom looks fantastic in natural light but cold at night. Don’t despair and on’t be afraid to keep trying things. Our entrance hall in the last house was fur different colours before we found the perfect one. I really don’t want to rag on my husband on social media, that’s not cool. He has fabulous qualities but then there are his weaknesses, I guess we are a good couple because we compliment each other, where I am weak he is strong and vice versa. Home repairs, maintenance and the like is not his thang, and actually I enjoy that, so cool. However when I give you an empty paint can and say bring me back a gallon of this paint and you come back with a different color, well? Second time in two weeks, he actually caught himself before he drove away from the paint store, again I give him an empty bucket, ask him to bring me back a gallon of paint. He goes to the paint store and just asks, “Can I get another gallon of celery mint green paint?” He just accepts what the clerk gives him, pays and when he gets to the car decides to check. Yup he got the right color, but it was in a flat not a satin finish. Thankfully he went back and exchanged that before coming home with it. Sooo the big wall I am now sponge painting, the base coat I had picked out was a deep kind of olive green. I got half way through painting the wall the base coat color and then stopped and realized this was not the same color as as my small sample square. So now the base coat is teal instead of deep olive green. I’m okay with it so I let it go, it is mostly covered by the top coat paints I am sponging on. One thing I am glad of is I went with two colors for sponging on, the light green and white. I use mostly the light green but dabs of white. That gives a nice variation. It’s variegated. I go so far as to use a black magic marker and write on blue painters tape and tape it to the empty paint can how many square feet of this exact paint I need. I have never ever in over 40 years seen him just walk up and down the aisles of a hardware store or a big box home improvement store to see what they have. He has no curiosity at all when it comes to anything home improvement. We are a bit of an odd couple I suppose. Okay so my base coat is now teal, not what I picked out but it’s okay. I have some spots with the sponge painting where I did too many small dabs, it looks bad, I was up at the highest point with the step ladder so I suppose I was teetering and worked fast, now there are certain spots I am going to have to go over with the base coat *again* and then re-sponge *again* to even that out. Just a small area but my eye goes to that area every time I am looking at the wall so I gotta do it. Welcome to my world. Once I sent Mike out for basil and he came back with a packet of seeds. Another time I asked for sprouts for a thai dish and he came back with Brussels sprouts! This entry was posted on July 3, 2018 by The Pink Agendist in art, life and tagged gillian lynne, homophobia, lgbt, sotogrande.